Cloud computing has recently emerged as a new paradigm for hosting and delivering services over the Internet. It is an attracting technology in the field of computer science since it allows starting from the small and increases resources only when there is a rise in service demand. Load balancing can improve the Quality of Service (QoS) metrics, including response time, cost, throughput, performance and resource utilization in Cloud environments. It can be described as an optimization problem and should be adapting nature due to the changing needs. 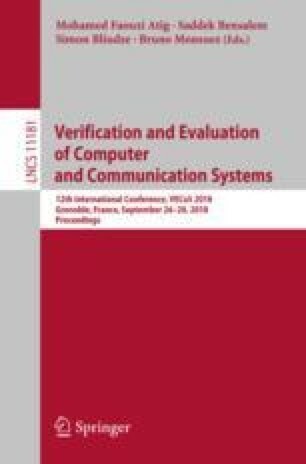 In this paper, we propose a first step towards formal verification of dynamic load balancing protocols in the Cloud. The proposed approach offers a way to easily implement, analyze and compare different load balancing protocols, based on a generic model. We focus on the study of centralized and dynamic load-balancing protocols. We propose a high-level model allowing to specify a set of well known load balancing protocols. A formal and QoS evaluations has been performed automatically, using Uppaal framework.